An ideal campsite for exploring local market towns or for walks in the Malvern Hills. Blackmore campsite enjoys a peaceful setting in the Worcestershire countryside with stunning views across to the Malvern Hills. It combines plenty of green open space with more sheltered pitches around the campsites perimeter. One of the appeals of this award-wining site is its proximity to the Malvern Hills, an area of Outstanding Natural Beauty, which offers fantastic walking and cycling opportunities on over 100 miles of paths and bridleways. In fact, so popular is the area for walking, it hosts a nine-day walking festival. If you prefer walks of the not so challenging type, the pretty village of Hanley Swan, with a choice of two pubs, is just a mile’s stroll from the site. 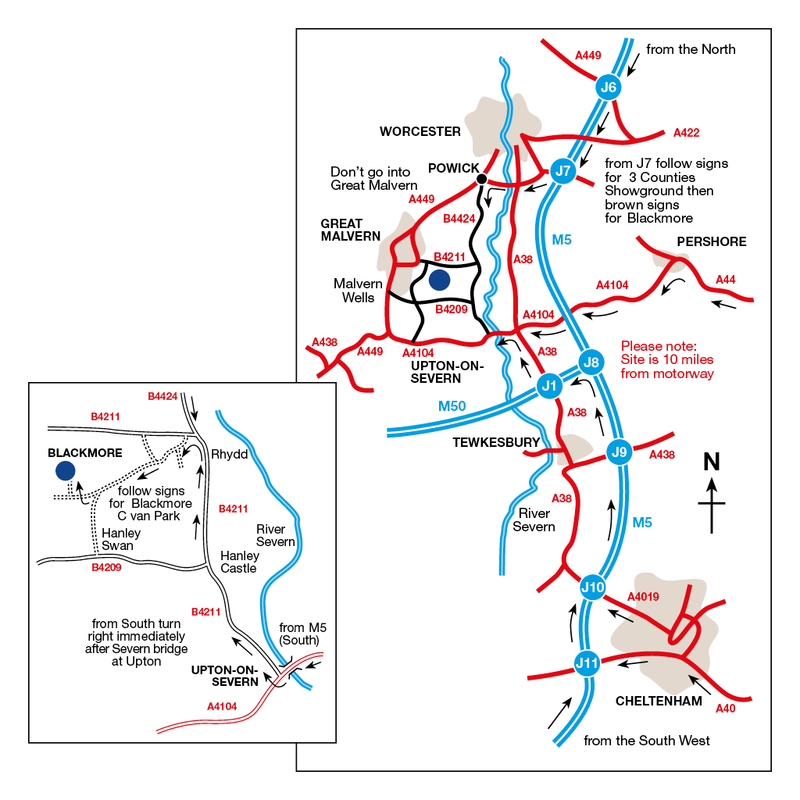 If you want to travel a bit further afield but leave your vehicle behind, there is a bus stop 400 yards from the site entrance with restricted services to Tewkesbury and Worcester daily. Site has a recreation room with pool table. TV reception is poor in some areas of the site. 100% coverage cannot be guaranteed due to rural location, weather conditions and changing flora. Hotspots are available. More information. Several farm shops are close to the site and Great Malvern and Worcester both host Farmers’ Markets. The Swan in Hanley Swan serves excellent local produce. Malvern Priory is a magnificent church dating back to 1085 that's home to a superb collection of stained glass, carved misericords, Medieval tiles and lovely pastel-coloured stonework. The Panorama Tower was built between 1801 and 1812 as part of the Croome Park Estate for the 6th Earl of Coventry. It’s a domed and circular temple-style folly designed by James Wyatt. Step into the birthplace of Britain’s most celebrated composer, Edward Elgar. Learn about his family, childhood and the places that inspired some of his most famous compositions.